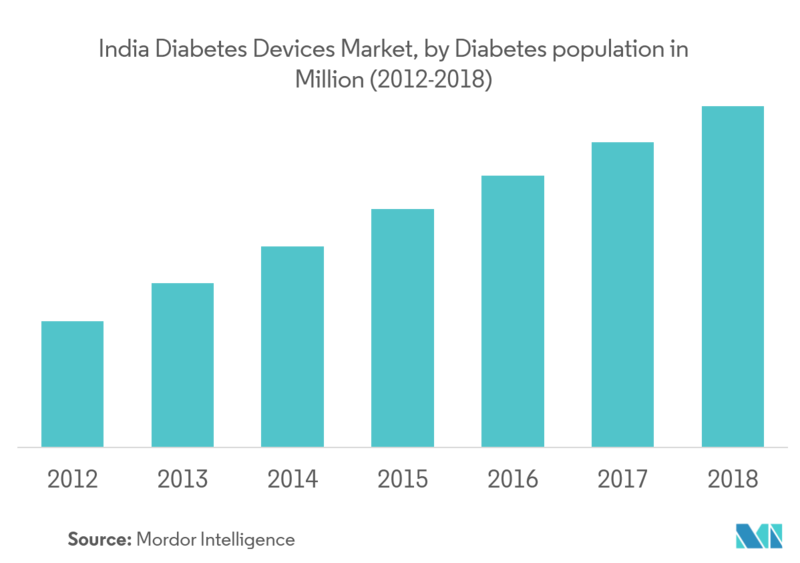 The Market is segmented by Management Devices (Insulin Pumps, Insulin Pens, Syringes, and Cartridges) and Monitoring Devices (Self-monitoring Blood Glucose (Hospital and Personal Use) and Continuous Glucose Monitoring). 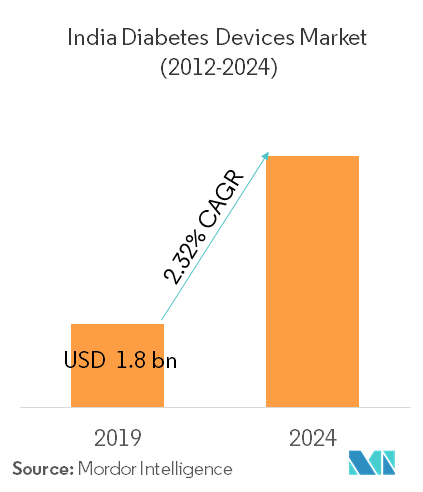 The Indian diabetes devices market has been estimated at USD 1.8 billion in 2019, registering a CAGR of 2.32% during the forecast period from 2019 to 2024. Diabetes care devices are the devices used to control the glucose levels in the blood. The main types of diabetes care devices include glucose monitoring devices and management devices. The continuous glucose monitoring devices have become immensely popular due to the rise in technological innovations. India holds the second largest market in the diabetes care devices market after China in the Asia-Pacific region, because of the high diabetes population in the country. The diabetes population is also expected to reach 85.9 million in 2024, in India. Monitoring Devices Held 7.50% of Share in India Diabetes Devices Market in the year 2018. 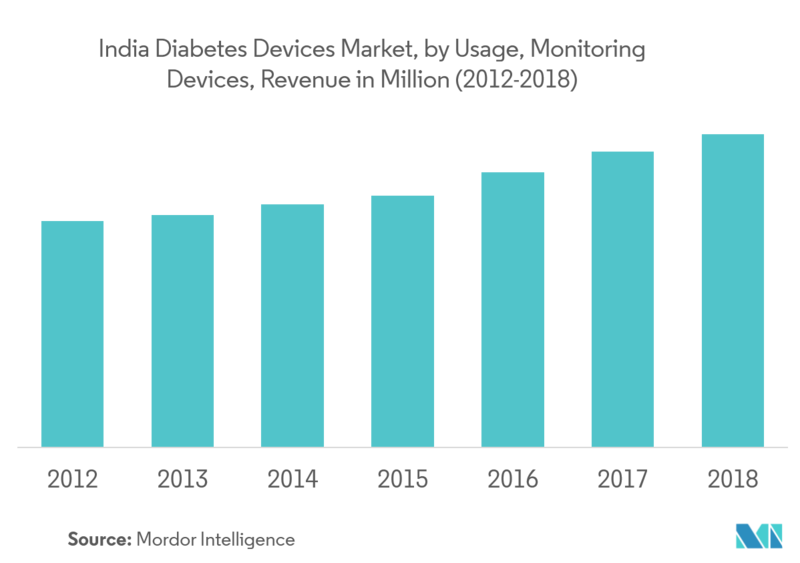 Monitoring devices include self-monitoring blood glucose (SMBG) and continuous glucose monitoring devices (CGM), where SMBG segment of the market studied has the highest share in the year 2018, with a revenue of USD 0.1 billion. The frequency of monitoring glucose levels depends on the type of diabetes, which varies from patient to patient. Type-1 diabetic patients need to check their blood glucose levels at regular intervals to monitor their blood glucose levels and adjust the insulin dosing accordingly. Therefore, if a patient performs 5-6 tests in a day, the average expenditure on test strips would be over USD 180/month. These expenses add to the already high diabetes management costs and are impeding the market growth. The current CGM devices reduce all the finger prickings for measuring blood glucose levels. It shows a detailed representation of blood glucose patterns and tendencies than what can be achieved by conventional routine checking of glucose levels at set intervals. India has the Highest Number of Diabetes Patients next to China. With 50.8 million people suffering from diabetes, India continues to be the ‘diabetes capital.’ By 2030, nearly 9% of India’s population is likely to be affected by diabetes, according to a study conducted by the International Diabetes Federation. Obesity, especially central obesity and increased visceral fat due to physical inactivity, and consumption of a high-calorie/high-fat and high sugar diets are the major contributing factors for diabetes in Indians. The most prominent work culture perpetuated in the country, which includes sitting for hours in one position and eating fast food with little or no physical activity, is a significant contributor to diabetes in the working age group, causing this rapid increase in diabetes cases in India. 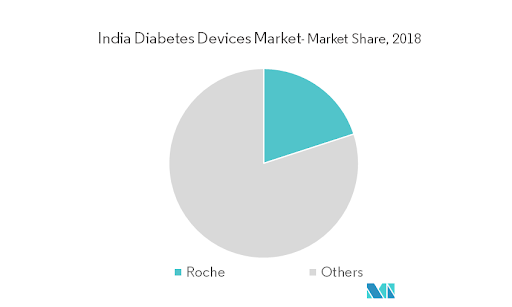 Indian diabetes devices market is highly fragmented, with a few major players. Abbott’s new FreeStyle Libre Flash Glucose Monitoring System was approved, which is the first continuous blood sugar monitor for people with diabetes that does not need backup finger prick tests. The innovations in test strips are increasing and are under development. For example, the new test strip includes features, such as underfill detection, and provides the user with the ability to reapply blood when the test strip is underfilled (“second chance” sampling).